Jeff Haas is the founder and CEO of Haas Designs. 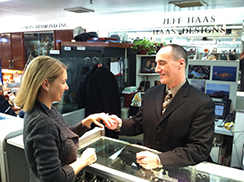 Jeff offers more than 30 years of experience ensuring his customers find that flawless piece of jewelry. Jeff grew up in the jewelry industry, beginning his career at one of the world’s largest jewelry firms at the age of 19. Over time, he became involved in all aspects of the business, specializing in diamond trading, jewelry design and manufacturing. This experience enables Jeff to assist his customers in identifying what they need and guarantees their ultimate satisfaction. Haas Designs is located in the heart of the NYC Diamond District. The benefits of this location are immeasurable. Jeff has accessibility to all of the finest artisans, diamond cutters and gem stone suppliers. Jeff has his finger on the pulse of the latest trends, which originate from many designers showcased at various jewelry shows throughout the year. His philosophy is simple: if you treat your clients fairly, even generously, you can already consider yourself successful.